When baby arrives, having a trusted pediatrician is going to be incredibly useful. They are there to answer any questions you may have and to ensure baby is happy and healthy. Therefore, it makes sense to ensure you are choosing a pediatrician you can trust. Now ideally, you’ll want to choose a pediatrician when you’re still pregnant. It’s the last thing you’ll feel like doing once baby arrives! However, even if you have left it until the birth of your little one, there are some useful tips that can help you to ensure you choose the best pediatrician available. 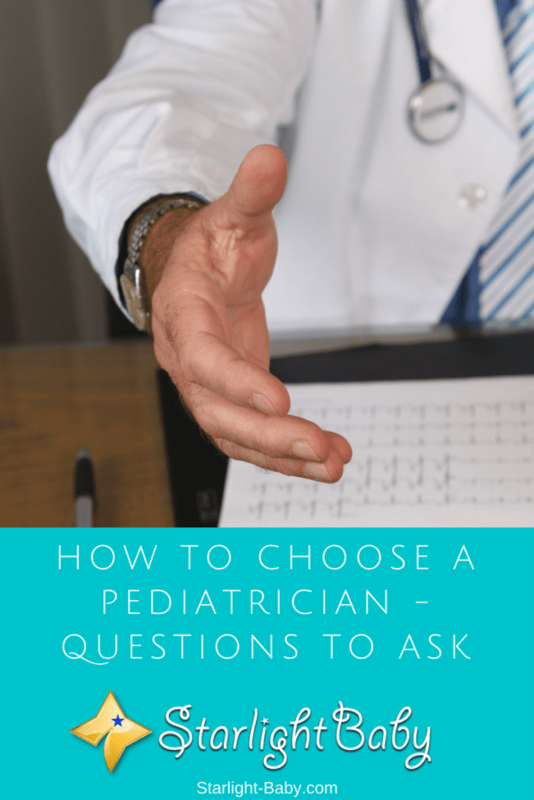 Here, we’ll look at how to choose a pediatrician, including the questions you’ll want to ask during the interview and what to look out for. There’s a lot of things to look out for when choosing a pediatrician. It’s important to look at more than just qualifications. You’re going to be spending a lot of time communicating and dealing with your pediatrician so it’s essential you find one you get along and feel comfortable with. Another thing you won’t necessarily think of when looking for the right pediatrician is waiting times. How long will you typically have to wait to see them? Is there a child-friendly waiting area you can use? Also consider how easy it is to get to the pediatrician and whether they do home visits if required. All parents discover that getting places once they’ve had a baby, suddenly becomes a thousand times more difficult. So, ensuring you can get to the pediatrician easily enough, as well as having ample parking close by is an important consideration to make! You can always head to the pediatrician’s office and get a feel for how they operate. Talk to their other patients and see what their experience has been like. These are the main things you really need to look out for. Obviously, you need to know they are qualified to do their job, but there’s so many more things to consider. So, now you know what kind of things to look out for, where can you actually start looking for a pediatrician? Asking Your Friends, Family And Coworkers – One of the best ways to find a good pediatrician is through referrals. Ask your friends, family and coworkers which pediatrician they used and what they thought of them. You can trust the experiences of the people you know, so if they suggest a particular pediatrician, you can be sure they’re worth contacting. The American Academy Of Pediatrics (AAP) – If you head over to the AAP’s HealthyChildren.org website, you’ll find referrals to certified pediatricians. If you look for one using this method, you can be sure they’re fully qualified. Medical Societies – Your local medical society can also provide referrals to pediatricians who are looking to take on new patients in your area. This is one thing many parents don’t realize before they start looking – not all local pediatricians will be taking on new patients as they could already have a full patient list. So, when looking for a pediatrician, it’s important to realize you may not necessarily get the one you want. Once you’ve found a pediatrician you like, it’s important to ask as many questions as possible. Here, we’ll look at which questions are most important before you agree to use their services. These can be often be emailed, but it’s usually recommended to ask these questions during the initial meet and greet so you can better assess how confidently and easily they’re able to answer them. Q1: What Medical School Did They Attend? While we mentioned earlier you shouldn’t just consider qualifications alone, they’re still an important consideration. You need to make sure the pediatrician is fully qualified and you can do that by asking where they attended medical school. A little research after the appointment will help you to establish whether they’re telling the truth and if there’s a record of their attendance/grades. You can find this information in the medical directories often found in local libraries. Q2: What Is Their Childcare Philosophy? You’ll want to make sure you have the same core beliefs and values as your pediatrician so ask them about their philosophy on breastfeeding, vaccinations, alternative medicines, child discipline and sleep. While you don’t have to agree on everything, it is vital you agree on the big stuff if you don’t want to run into problems later down the line. Q3: How Do They Handle Emergencies? Each pediatrician may have a slightly different approach to emergencies. So, it’s a good idea to find out what the protocol would be if an emergency was to arise. Would you be able to just walk in and get an appointment there and then? Also ask about out-of-hours emergency procedures. Q4: Will They Make House Calls? If you live in an area that’s a little out of the way of the clinic, will the pediatrician make a house call? If not, you’ll either need to ensure you can find a way to get there in-person, or you’ll need to find another, closer pediatrician. Q5: Will They Accept A Payment Plan? If you have insurance, it should cover your pediatrician appointments. However, if for any reason it doesn’t, would the pediatrician be able to offer a payment plan? If not would you be able to afford the cost of treatment/appointments without it? Q6: Which Hospital Are They Affiliated With? In the event your child is to be referred to hospital, which one would the pediatrician be referring to? It may not be the one you expect so it’s definitely worth finding this out. You’d also need to know whether the hospital would offer 24-hour visiting and whether you’re allowed to stay overnight if your child is admitted. Q7: How Long Does It Take To Get Non-Emergency Appointments? You obviously don’t want to wait weeks to be able to see your pediatrician! While there may be times appointments are slower to get, whether it be down to emergencies or unusually high numbers of appointments being booked, generally you should find it quite easy to get an appointment. Q8: How Much Direction Will They Give You? Some pediatricians are happy to let you make a lot of the decisions, whereas others prefer to give a more directional service. Think about how much freedom you want to make decisions regarding your baby’s routine etc, and decide whether the pediatrician’s style is right for you. These are the main questions you’ll want to ask. But what if, after you’ve gone through this process and you end up not liking your relationship with the pediatrician? If for some reason, you aren’t happy with your chosen pediatrician, it is possible to make a switch. It’s quite easy too. All you need to do is call the pediatrician’s office and ask to have your records transferred to your new pediatrician (once you’ve found one). However, unless the pediatrician has made a serious error, it’s worth holding out for a few different visits before making a decision on whether to switch. It can be strange handing over part of your parenting reigns to anyone, so give them a chance before deciding whether they’re a good fit or not. Overall, finding the right pediatrician can be a time-consuming process, but it’s absolutely worth the effort. You need to make sure you’re 100% comfortable with the pediatrician and that you can trust them completely. If your question wasn’t answered here, please let us know by leaving a comment below and we’ll be happy to help. You’re also welcome to join our forums, where you can talk with hundreds of other parents in a matter of minutes! I actually didn’t choose the pediatrician before my first one was born. We just didn’t really think that it was needed to pick it during pregnancy. Big mistake. When he was born, we had to rush it and find a good one which was A LOT of effort. Luckily, we have a friend who’s husband knew one and was in close relationship with him. He recommended us and the pediatrician took us in very quickly. I don’t know why but when we met him, we just knew that he is the perfect fit for us and our baby. The way he spoke and showed his caring/humane side impressed us so much. We already knew that he is a good doctor with a lot of qualifications and experience prior to the visit so this was a very easy choice for us. But I do agree with you. If possible, I recommend the parents seek a pediatrician while still pregnant to avoid possible problems. You are lucky to have found the pediatrician perfect for your baby. Thank God for friends! For those who are still pregnant, it is best to start looking for a good pediatrician because you will be needing one and be visiting one often as baby grows up. Ask relatives and friends for information regarding their own pedia and give him/her a visit if you can to see how he/she deals with patients. I live in a small town where there are not many medical facilities. There are also not many options for pediatricians. In the last four months, we took our baby to the hospital to give him vaccination, but we have not consulted any pediatricians yet. Recently, when the baby developed coughing, we were worried. We talked with many parents and most of them recommended them the pediatrician. Thankfully the baby’s cough in under control. Thanks for this well detailed tips on how to go about getting a good pediatrician for one’s baby/kid. It’s actually a very difficult task to get a well known pediatrician that is quite good at his job in our recent economic situation but I definitely agree and believe that using referral is the best way to go about getting a good pediatrician. The person that referred you to any pediatrician, probably your close friends, family or relations, already have an experience with the so pediatrician. All you need to do is to get all the necessary information about the pediatrician from your referral and then make your decision on backing the horse with him or look for another alternative. Your relatives’ and friends’ personal experiences with their babies’ pediatricians will help guide you in making your choice. Personally, I would say it’s a matter of your baby being comfortable or relaxed with the doctor. He/She doesn’t necessarily have to be the best among the rest. What matters is how comfortable you and your baby are when dealing with the doctor of your choice. I really like that one of the questions is about how the pediatrician will handle emergencies. After all, when you’re picking one you want to have your baby’s health at the forefront of your mind. Because of that, you want to take all situations such as emergencies or house calls into consideration.